Dragon’s Domain Records presents the world premiere soundtrack release for A SOUND OF THUNDER, available through buysoundtrax.com. 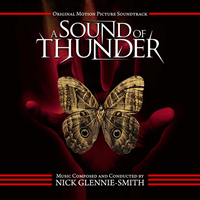 A SOUND OF THUNDER features music composed and conducted by Nick Glennie-Smith (THE MAN IN THE IRON MASK, WE WERE SOLDIERS, ELLA ENCHANTED) for the 2005 science fiction film directed by Peter Hyams (CAPRICORN ONE, OUTLAND, 2010), starring Edward Burns, Catherine McCormack, Sir Ben Kingsley, Jemima Rooper and David Oyelowo. Written by Ray Bradbury and first published in 1952, A SOUND OF THUNDER was one of the first genre stories that examined the cause-and-effect of time travel on the traveler’s present day: how altering the past can have a major effect upon the future. The story takes place in the future, when technology has made time travel possible. This technology has been commercialized by one man, who uses time travel as a way of earning vast amounts of personal fortune by charging big game hunters massive fees to go back in time and face the ultimate game: the Tyrannosaurus Rex. When one of those hunters disobeys that rule and steps off the path, accidentally killing a butterfly in the process, the team returns home to discover the butterfly’s death has had a devastating effect on the world they’ve returned to. At a little over 4300 words, Bradbury’s story had focused on a single time safari and its irreversible effect upon the present day of 2055. The film script expands the story greatly, adding many more characters to the safari team and fleshing out the questionable Time Safari Inc. business model. 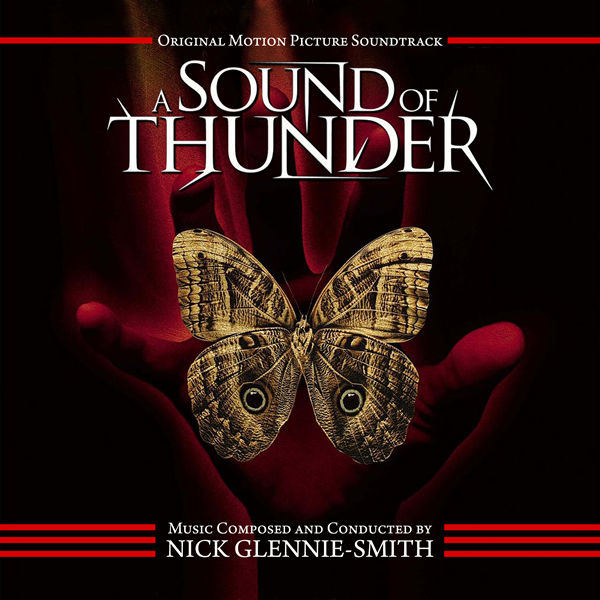 The score for A SOUND OF THUNDER is the work of Nick Glennie-Smith, a British-born composer who is one of the earliest composers to emerge from Hans Zimmer’s training ground, Media Ventures/Remote Control Productions. Recorded and mixed in London, the score opens with a powerful, surging rhythmic atmosphere which soon develops into a growing cluster of active figures in the orchestra, building to a dominating sense of perilous adventure. The score is heavily thematic and grounded in the main theme, which recurs frequently to accentuate moments of heroism or to emphasize the wonder of what Time Safari has been able to accomplish. Tenuous string writing presents a growing unease and supports moments of suspense, often emerging into aggressive, pulsating fortissimo as the tense atmosphere explodes into roaring action. The action music in A SOUND OF THUNDER is articulate and propulsive, driving the action forward through simple rhythms and deftly orchestrated sonic textures. Musically educated at New College, Oxford and with a background in the late ‘70s London music scene, Glennie-Smith was working as a recording engineer when he met Hans Zimmer, then a synth programmer assigned to the same record albums. Both began to write commercial jingles for music production company Air Edel, where they met Stanley Myers, a prolific composer of British film and television since the 1960s; through Myers, both began to supply cues for film scores. By the early 2000s, both Zimmer and Glennie-Smith had relocated to the US and were working amongst the team at Media Ventures Entertainment, the state-of-the-art music and audio post production facility that Zimmer had co-founded in 1989. When Media Ventures was succeeded by Remote Control Productions in the mid-2000s, Glennie-Smith continued to travel to Los Angeles from his home in rural Virginia to work on dozens of hit film scores functioning as composer, musician and conductor for film scores developed by RCP. Nick’s first screen credit came as co-composer, with Hans Zimmer, for Michael Bay’s THE ROCK. This was followed by a number of independent and TV movies with the fledged composer working solo on such films as HOME ALONE 3, THE MAN IN THE IRON MASK, THE LION KING II: SIMBA’S PRIDE, and MAX Q. He wrote the theme and music for the UK/Canadian TV series, THE SECRET ADVENTURES OF JULES VERNE, provided a broad orchestral score for the TV miniseries ATTILA, Randall Wallace’s poignant Vietnam war drama WE WERE SOLDIERS and ELLA ENCHANTED. Recent credits as composer include SECRETARIAT, A BELFAST STORY and HEAVEN IS FOR REAL. A SOUND OF THUNDER was originally set to be released in 2003. Production began on the film in 2002 but was slowed when severe floods in the Czech Republic caused considerable damage to the sets. To make matters worse, the film’s original production company went bankrupt during the postproduction process, which prolonged the release of the film until 2005. The score has never been released in any format and fans of the composer have long been waiting in anticipation for its release. Dragon’s Domain Records is excited to have A SOUND OF THUNDER as its inaugural release. A SOUND OF THUNDER includes liner notes written by author Randall Larson, with the participation of the composer. The music has been mastered by James Nelson at Digital Outland. A SOUND OF THUNDER is a limited edition release of 1000 units. A SOUND OF THUNDER will begin shipping on the week of 03/16/2015 and can be ordered at www.buysoundtrax.com . The first 100 copies ordered trough the buysoundtrax.com website will be autographed by the composer at no extra charge.